Spanning over 144 acres, the Bandy Canyon Ranch welcomes you with its private gated entrance. Set deep in Bandy Canyon rustic cabins dot the property and can accommodate overnight guest. With its outdoor backdrops, sits an authentic 1930's adobe lodge with two fully equipped kitchens, antique stoves, fireplaces, and dramatic pool surrounded by lounging and entertainment areas. A charming terrace and wedding site are also available on this property. Bandy Canyon is a one-of-a-kind spot that we fell in love with in person. Thanks to Naomi's amazing Google skills :) we found all sorts of great photos online of the venue. But when we were able to visit the location, we immediately knew that it would be the perfect spot to have the wedding. 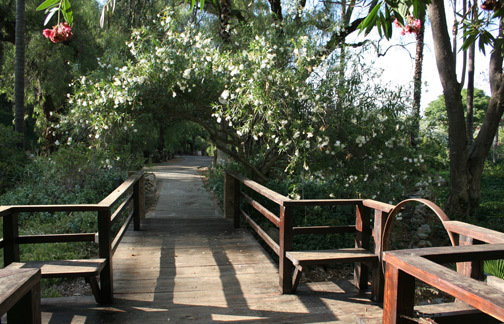 It's a Ranch originally owned by HG Fenton which was one of the very first real estate pioneers in the San Diego Area. In short, has a killer outdoor setting with all sorts of photo ops and unique spots to check out. Since the wedding is in August and from 6-12, it will start out really sunny and warm and should cool off a bit at night but will be really comfortable. The Ranch has all sorts of shade provided by numerous trees, and by nightfall the food, band, friends and family will provide for more than enough warmth for us all to enjoy. We booked 2 passenger buses that can transport guests to Bandy Canyon which will be leaving from the Mission Valley Courtyard Marriott at 4:30 and will be returning to the same location after the wedding.